First we passed through the Mustafapaşa district and then we followed the road which started from the wine distillery and drove uphill. After reaching the plateau, we proceeded to the left for 200 meters and passed through a small mosque which still had an Orthodox bell tower on it. Approx. 30 meters later, a road on the left led downward vertically. Here in a cave we discovered a coffee bar, the cave was carved by a spring. Its owner, Mehmet Balta, started arranging this valley nearly 6 years ago and opened it to public. 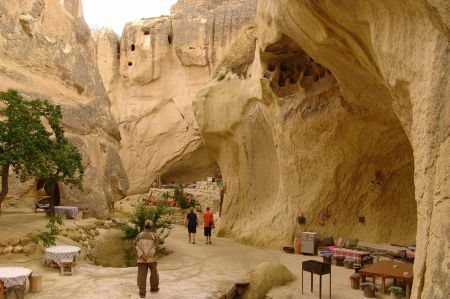 The church located at the entrance of the valley was destroyed and then later, it was restored during Greek Period, missing parts were rebuilt again and a typical cave church was created. The church is considerably small but has a “basilica” structure, which means it has two mainmasts, two side pillars and an abscissa on the east side. There are 2 graves under the mainmasts. These were probably the graves of the people who restored the church. We assume it was a church which wasn’t open to whole public in terms of its size, maybe it was built specifically for a family and their graves were placed inside it. In those times, there were people who lived in Mustafapaşa, they were wealthy, dealing with wine and medical product trade. From the architecture of the houses on the plateau, it is understood that they were arranged in a simple yet very useful way. Other parts of Mustafapaşa seem to carry Greek architecture thanks to former Greek inhabitants. According to a common view here, Sinannos architects came from Mardin and the border of Syria, and the accuracy of this view seems to be confirmed by the fact that the architect of Mardin region is very similar to Sinassos. The Greek-speaking population (Greek-speaking people of the time were called Rum) benefited the caviar trade between Russia and Europe over centuries, for which they had a monopoly. Thus, the place had the impressive number of 40 churches. Before the so-called population exchange, 600 Greek-speaking and 150 Turkish-speaking families lived here. Instead of Rum, people of Macedonian mother tongue and Muslim faith were moved from the area around Kastoria in Greece to Sinasos. These initially constituted more than half the population. Rum moved from Sinasos to Greece, Nea Sinasos was founded in the northern part of the island of Euboea.